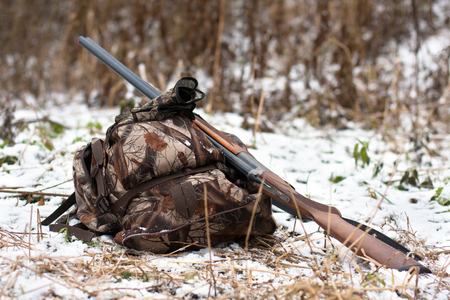 Whether you’re a seasoned hunter or new to the sport, it’s a known fact that your backpack must be filled with all of the essentials in order for you to find success on the hunt. Most hunters figure out what they need through trial and error, but we won’t put you through that! Here’s a list of some essential items that you’ll need with you for a day hunt! Yes, water is a no-brainer, but it’s also something easily forgotten, so write it on your packing checklist anyway just to be sure! This is the most important item you need when on your hunt. In fact, the majority of your backpack’s weight should be water– plan to pack enough in case of an emergency. Sometimes the night creeps up on you, so it’s always good to have a headlamp so you don’t have to fuss with a flashlight and still have use of both your hands. It’s good to choose one with SOS settings in the event of an emergency as well. There’s nothing worse than getting lost in the woods and realizing you forgot your compass at home. While you may have a GPS unit on you as well, having a compass that doesn’t rely on batteries is vital in the event you take a wrong turn. A good hunting knife is an important investment, and it’s definitely an essential in your hiking bag. Make sure the blade is sharpened, strong and specifically made for outdoor conditions. If you make a kill and need to clean yourself up afterwards, or you have to really use the bathroom in the woods, wet wipes are a great addition to your bag. Survival blankets weigh very little and can be a lifesaver if your day hunt turns into a night outside. They take up almost no space and if you have to utilize it, you’ll be grateful you brought it. Now that your bag is packed, are you ready to take to the outdoors? Silver Spur Outfitters & Lodge is your complete hunting guide to the backcountry of Idaho. Give us a call at 208-842-2417 today to learn more about the hunting options we have available and start planning your trip!